Well this has been an interesting few weeks, hasn’t it? It seems as if our cellular bodies are being prepared to hold higher percentages and frequencies of light. In order to make more room for the consciousness of light to be embodied, the very core structure of human conditioning is being challenged, triggered, and brought to the surface to be lovingly resolved. This can look like the resurfacing of core wounds, the remembrance of neglect or abuse, as well as being more susceptible to being drawn into the unprocessed pain or negativity of others. While it has been a very challenging time of facing the darkest pain and deepest fears within ourselves, it has also created a fresh mound of emotional soil where the energetic seeds of renewal can blossom into being. 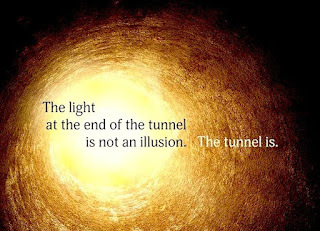 Perhaps you’ve sensed the light at the end of tunnel but keep bouncing back into pain, judgment, fear and victimhood. Not to worry. This entire alchemical process is merely making the most of this auspicious Fall season -- as we fall into our insecurities, pains, regrets and despair, only to deepen our relationship with truth so we may enter the new calendar year more authentic, allowing and aligned with the new energies of 2019. Since 2019 adds up to 12, which then adds up to 3, 2019 serves as a time of deeper spiritual communion as your human self, soul, and the Universe come into balanced harmony through the power of 3, or the number of the Holy Trinity. Hence, 2019 is where your deepest soul’s essence and highest life purposes emerge in awareness with synchronistic support from the Universe to bring your dreams to life. May you spend the remainder of 2018 making this landmark shift and enter the new year with offerings such as Angel Academy 9 to help you through this rapid transition at a miraculous and joyful rate -- all in aligned accordance with your soul’s contract in the Akashic Records. May you exit 2018 more grateful to be alive and faithful in the will of every soul as you step across the threshold into the Ascension timelines of 5D consciousness. You will still exist in a world filled with all the friends, family, and familiarities you know and love. Life will just unfold with greater precision and feature more nourishing heart-centered relationships as you view your reality from your soul’s unlimited perspective.